Whether coffee modulates response to endocrine therapy in breast cancer patients is currently unknown. The CYP1A2 and CYP2C8 enzymes contribute to tamoxifen and caffeine metabolism. 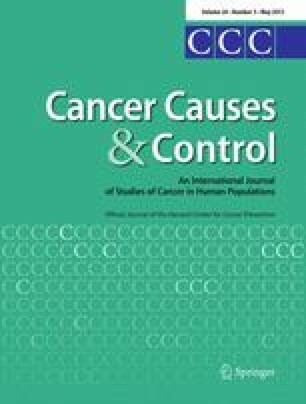 The purpose was to investigate the impact of coffee consumption on tumor characteristics and risk for early events in relation to breast cancer treatment and CYP1A2 and CYP2C8 genotypes. Questionnaires regarding lifestyle were completed preoperatively by 634 patients in southern Sweden. CYP1A2*1F and CYP2C8*3 were genotyped. Clinical data and tumor characteristics were obtained from patients’ charts, population registries, and pathology reports. Coffee consumption was categorized as low (0–1 cups/day), moderate (2–4 cups/day), or high (5+ cups/day). The proportion of estrogen receptor negative (ER–) tumors increased with increasing coffee consumption (p trend = 0.042). Moderate to high consumption was associated with lower frequency of discordant receptor status (ER + PgR–) OR 0.38 (0.23–0.63) compared to low consumption. Median follow-up time was 4.92 (IQR 3.01–6.42) years. Tamoxifen-treated patients with ER+ tumors (n = 310) who consumed two or more cups/day had significantly decreased risk for early events compared to patients with low consumption, adjusted HR 0.40 (0.19–0.83). Low consumption combined with at least one CYP1A2*1F C-allele (n = 35) or CYP2C8*3 (n = 13) was associated with a high risk for early events in tamoxifen-treated patients compared to other tamoxifen-treated patients, adjusted HRs 3.49 (1.54–7.91) and 6.15 (2.46–15.36), respectively. Moderate to high coffee consumption was associated with significantly decreased risk for early events in tamoxifen-treated patients and modified hormone receptor status. If confirmed, new recommendations regarding coffee consumption during tamoxifen treatment may be warranted. This work was supported by grants from The Swedish Cancer Society CAN 2011/497, the Swedish Research Council K2012-54X-22027-01-3 (PI H Jernström), the Medical Faculty at Lund University; the Mrs. Berta Kamprad’s Foundation, the Gunnar Nilsson Foundation, the Swedish Breast Cancer Group (BRO), the South Swedish Health Care Region (Region Skåne ALF), Konung Gustaf V:s Jubileumsfond, and Lund Hospital Fund. We thank our research nurses Maj-Britt Hedenblad, Karin Henriksson, Anette Möller, Monika Meszaros, Anette Ahlin Gullers, and Linda Ågren. We thank Sol-Britt Olsson, Nils-Gunnar Lundin, and Kristina Lövgren for taking care of blood samples and Erika Bågeman for taking care of blood samples and sequencing of CYP1A2*1F for the previous project. We thank Eric Dryver for proofreading.